My trip branches out from Fairbanks where I arrive and depart by air. in Denali National Park across from McKinley State Park, a 100 mile trip taking 2 hours. to fly over Mount McKinley. I returned to Denali National Park to camp again Wednesday night. 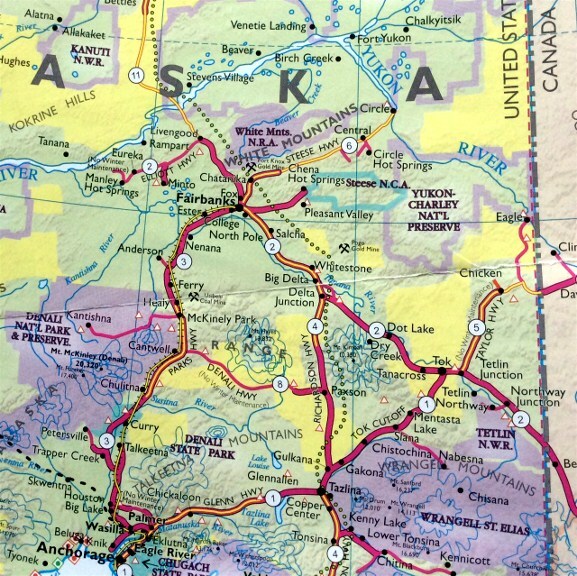 TOK, Alaska 100 miles back toward Fairbanks on RT. 2 and spend Day 4 resting and planning. an advantage than actually going into the Yukon and taking a trip ride as previously planned. returning back to THIS PLACE just outside Fairbanks, on the north side each evening. had a breakdown and directed me to a local laundry that had showers. They did not. they did. A local at the truck stop directed me just up the road to another laundry place. on a ATV and after some conversation, found THE PLACE I much needed. the get their laundry done. The rest of my trip was so rewarding. changed my mind about Alaska. The excitement of my return.